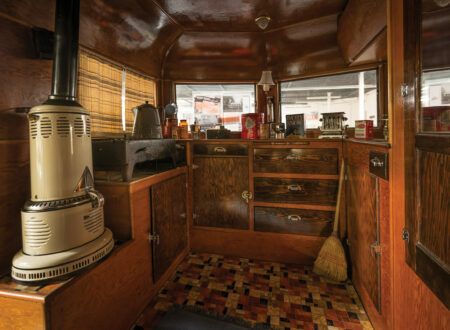 The GMC Motorhome is a six-wheeled embodiment of the zeitgeist of its age – for those who did not live through the post-war 1950’s to 1970’s era it is likely that they will not really grasp the level of creative freedom that was unleashed. The younger generations may realize that the music was good, that there were some great automobiles created, and that there were many larger-than-life characters who took their part in the near gladiatorial motorsport events of the time. But despite the presence of pictures, print articles and film footage the younger generation who did not actually experience those times will not really be able to appreciate how people’s thinking had been freed, the sky was the limit and even that wasn’t really the case, as man was flying into space and landing on the Moon. It was in that environment of creative freedom that General Motors realized that the people who had lived through the war years and had fought for liberty and freedom from oppression were looking for automobiles that would be expressions of that new found freedom. The Chevrolet Corvette was one result of this as was the Ford Thunderbird and Mustang. But people who wanted sports cars were not the only ones looking for ways to bring a truckload of refreshing “get away from it all” freedom into their lives, there were those who just wanted to pack a few of life’s creature comforts into a mobile “home away from home” and go experience new places and new things. 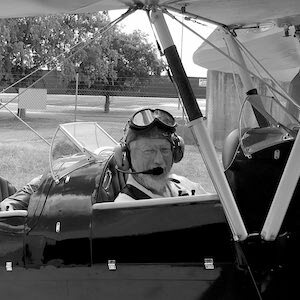 These were people who had typically lived through the Great Depression and the Second World War: they had dreamed of and fought for a new world of liberty, and in the post-war era they sought to make their dreams a reality. The era of the recreational vehicle was about to begin, and General Motors was about to create what was to be one of the greatest recreational vehicles ever made. General Motors had some visionary people working in product development as was evident in their creating the Corvette, and among those people there were those who could see that people had a new found freedom to travel and sufficient money in their wallets and purses to make it happen. Some like camping, and some like comfort, and there was a whole industry building up to provide caravans and “motorhomes” so that people could adventure in comfort. In the 1970’s this was becoming very popular as the generation who had been a part of the Second World War moved into their retirement years and wanted to enjoy them. 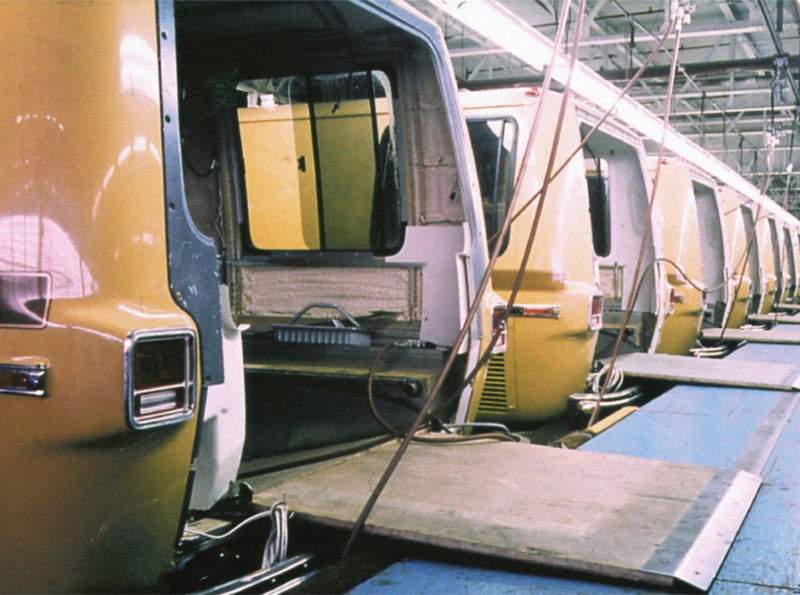 General Motors planners could see that the motorhomes that were being manufactured around that time were being made on truck chassis by businesses that used the common methods of caravan building. If you build a wood framed flat aluminum camper body on a truck chassis you get a camper that has all the comfort of a truck suspension – or lack thereof, and you have a vehicle that is just like a truck to drive. So the thought that developed at General Motors was to build a motorhome that blended the comfort and stylishness of a car with the living features of a “home from home”. 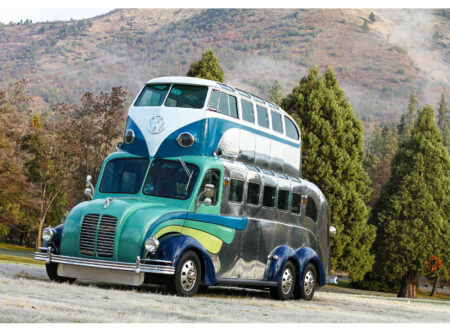 This was not to be a “camper on a truck chassis”: this was to be a real motorhome. That being said the project was under the general direction of General Motors Vice President Martin J. Caserio who was also the General Manager of GMC Truck and Coach and his vision was for a “Chevrolet of motorhomes”, meaning he wanted to build affordable motorhomes that GM could expect to sell in quite large volumes. This idea would be subject to some change in 1973 when Alex C. Mair took over from Caserio. Alex C. Mair, perhaps foresaw the that the new motorhome could become a “halo” vehicle for GMC just as the Corvette had become for Chevrolet. To this end he wanted the new motorhome to be a “Cadillac” of motorhomes. This aspiration would tend to ensure that the final design would be something that would deliver a halo effect for GMC. 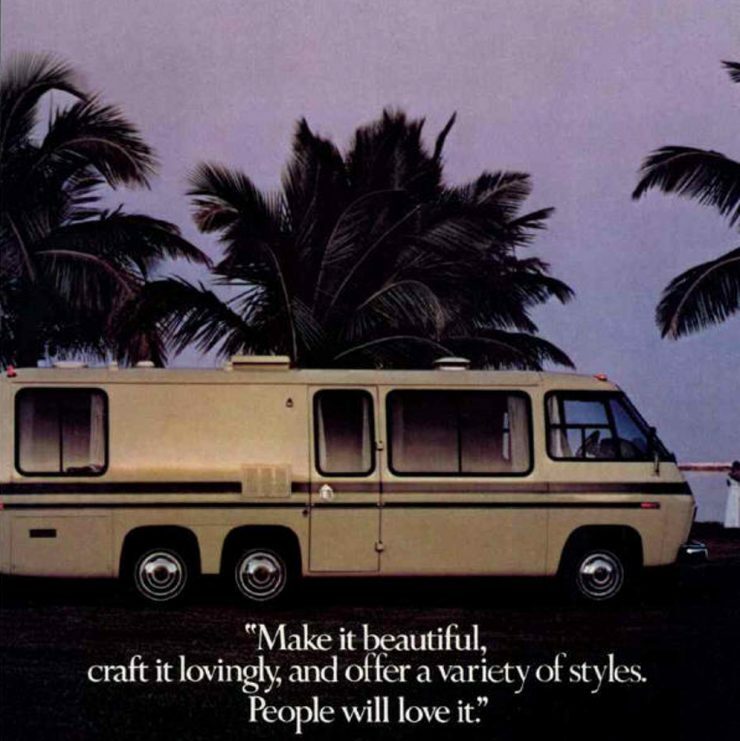 Work began in 1969-1970 on developing the concept for what should be the best design for a motorhome. GM’s designers set out the features that the new vehicle should have, and among these was a low and flat floor and a suspension system that would provide a “magic carpet” automobile-like ride. In order to achieve this it would not be possible to use a conventional front engine driving the rear wheels layout as was common on a truck chassis. Instead the engine and transmission would have to be located either at the rear driving the rear wheels or the front driving the front wheels. 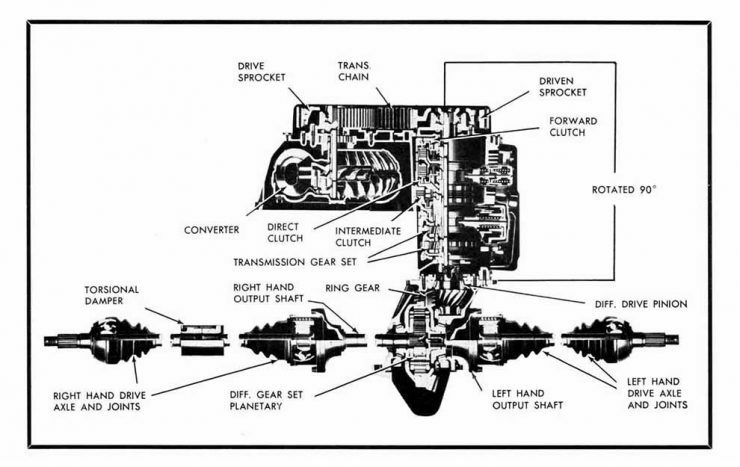 Putting the engine and transmission in the rear would create technical issues and costs associated with connecting the controls from the front to the rear, but General Motors already had a Unified Powerplant Package which comprised the engine, front-wheel-drive transmission and independent torsion bar suspension system being used in their Oldsmobile Toronado that would work perfectly in a mobilehome. 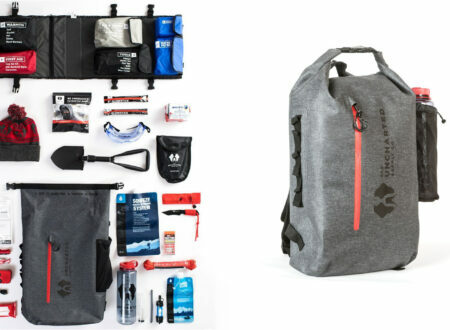 This system was it was decided that would be the most practical and least expensive to use. This engine was a 455 cu. in. gasoline V8 which drove through a three speed Hydramatic automatic transmission using a heavy chain drive. GM were not going to be the first to use this engine and transmission in a motorhome: four other motorhome makers, Revcon, Cortez, Travoy, and Tiara, were already doing this so the system was tried and proven. For the rear suspension there was a need to eschew the use of truck like leaf springs and to use something that really would provide that “magic carpet ride”. 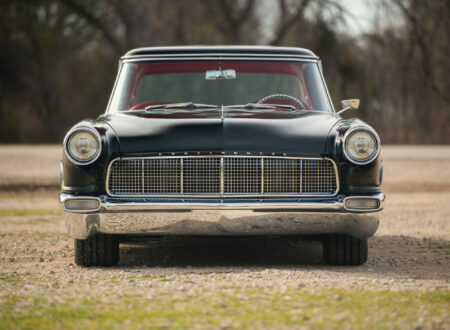 It was decided to use a fully independent system incorporating tandem rear wheels with leading-trailing arms and a hydraulic-air springing system from GM’s Saginaw Division. The power-steering pump was used to provide the necessary pressure for the system. This system would be able to be contained in a narrow area on each side of the vehicle leaving a flat floor in between. Because there would be storage cabinet provisions on both sides of the vehicle the covers for the rear suspension could be kept out of sight, and out of the way. The exhaust system was routed along the right side of the body under the chassis with the exhaust pipe ending at the rear right side. A test chassis was constructed with a boxy looking bus-like body placed on top to keep the people who would photograph vehicles on the GM test track unable to figure out what the design team were up to. This test “bus” was nicknamed the “pie wagon” although some didn’t like that and preferred to call it the “chicken coup” instead. Shakespeare once said “A rose by any other name would smell as sweet” and when GM management took a ride in the “pie wagon” they were suitably impressed with the handling and smooth ride. They approved for the project to continue and so the “chicken coup” was all set for its transformation from an ugly duckling into a swan. With the overall concept pretty much decided work was able to begin on the floor plan for the new motorhome. The initial plan was for a 20′ and a 24′ model, but as work progressed on developing floor plan designs this would later be changed to 23′ and a 26′ models. The floor-plan work was done at the General Motors Technology Center at Warren, Michigan and the design team used designs from GM’s Frigidaire Division. In order to evaluate their floor-plan designs the team built a full-size plywood seating buck so everything could be physically tried out. Meanwhile as the vehicle was being worked on there developed a bit of a contesting between Chevrolet and GMC as to who should actually have control of the project. GM management used mathematics to resolve the dispute: Chevrolet were in charge of vehicles under 10,500lb weight, and GMC those over, the motorhome was heavier than 10,500lb and so it was awarded to GMC and Chevrolet just had to come to terms with the fact that they couldn’t have their Corvette and a fancy motorhome too. While all these machinations were going on the GM Design Center had invested a couple of years into suitable designs to make the new motorhome a standout vehicle. GMC had planned to use fiberglass front and rear caps but flat sides much like a bus or coach. This would have been boringly ordinary and not at all likely to gain the sort of stand-out attention that something with real aesthetics would. The GM Design Center work was creative and some of the designs were too futuristic even for the 1970’s. The man in charge of the motorhome project design was Michael Lathers and he was not only faced with the job of creating an excellent and practical design, but also for advocating for it in the face of those at GMC who favored the cheaper option of a slab sided bus style camper van. The motorhome project was by this time known as the “TVS” (Travel Vehicle Streamlined) and it went through various model numbers as the design progressed. 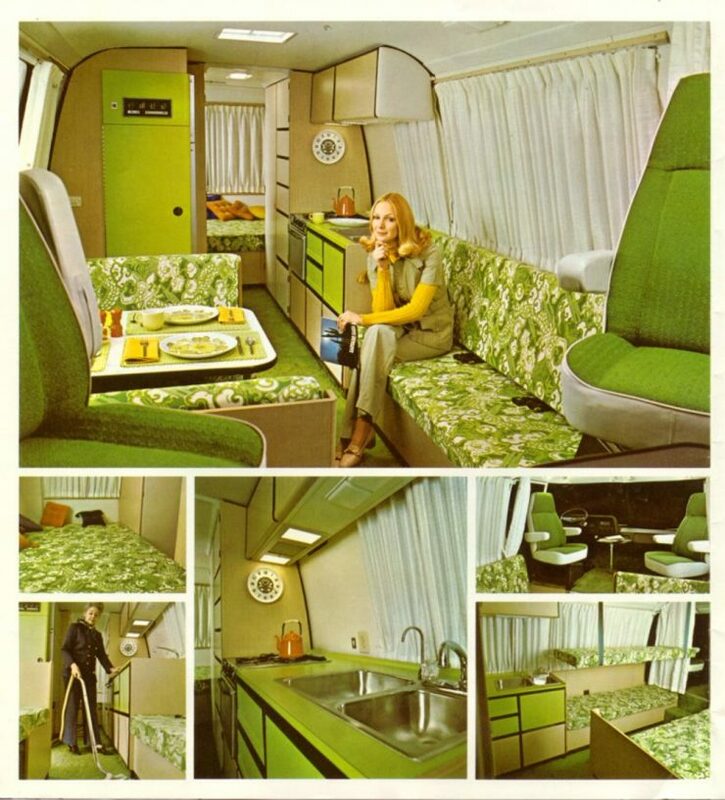 Its existence was announced to the press on February 7th, 1972 and a prototype was dispayed at the Transpro ’72 trade show in Washington DC that year, confirming for the manufacturers of motorhomes what they had feared: that GMC was going to provide them with some competition. 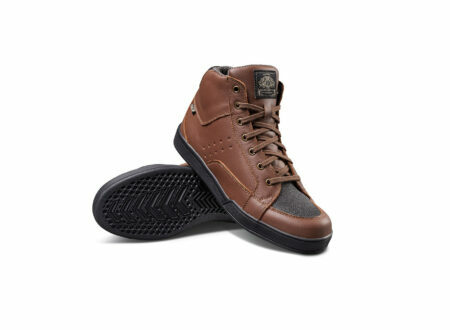 The announced expected price range was to be in the range $12,000-$16,000 USD depending on model and options. Three staff members were in charge of getting the vehicle up to the pre-production stage; engineer Kurt Stubenvoll was in charge of product development, Ralph Merkle was in charge of chassis development, and aeronautical engineer John Locklin was in charge of body engineering, and thus for taking Machael Lathers concept from design into reality. Locklin had both his training in aeronautical engineering and his experience in automobile manufacture to help him come up with cost effective solutions to the problems associated with getting the “TVS” into production. There were a number of problems that were encountered during the early engineering and preparation for manufacture. One was that the original suspension design proved to be too expensive to manufacture which resulted in a couple of options being trialed before a system from Firestone was adopted for final production in 1971. The pre-production work included the need to make a full-scale clay model and full scale drawings for the engineering and mechanical components. The full scale clay model was used to create plaster casts in order to prepare the tooling needed to make the body panels and the drawings for these. While the external work was in progress there were six in the team working on the final interior designs. This group consulted with “House and Garden” magazine for ideas especially regarding colors, materials and overall decor. It was the work of this group that led to the change from 20′ and 24′ models to 23′ and 26′ models which caused some problems as Ralph Merkle had based his work around being able to use a significant number of components that were already in production for other vehicles and the dimensional changes compromised that ability. There was also a problem in matching exact chassis dimensions to the new body dimensions and when John Locklin could not give Ralph Merkle the exact body dimensions he needed in time so he could get subcontractors to work building the chassis Ralph was placed in the situation where he had to guesstimate the dimensions. As it turned out he was 2″ out and so the rear frame cross-member protruded 2″ out of the back of the vehicle: happily no-one noticed. One of the advantages of the front engine with front wheel drive configuration was that it enabled the provision of a removable rear body cap which made it very convenient for fitting out the interior, providing a large opening through which to load the furniture and appliances. The GMC Motorhome entered production in 1972 for the 1973 model year and was available as the Model 230 (23′) and Model 260 (26′) either fully fitted out by General Motors or as an empty shell “TransMode” model. The TransMode model was made for those who wanted their own custom interior layout and this included both people who were looking for a motorhome and customers who wanted to fit the vehicle out for other purposes such as mobile training facilities, ambulances or mail delivery. 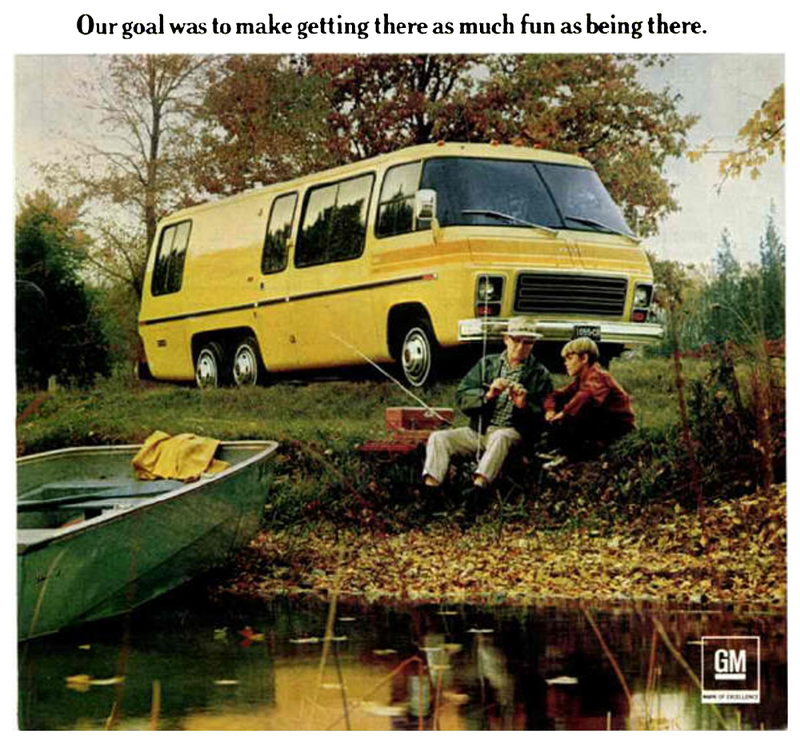 GM announced the end of production for the GMC Motorhome on November 11th, 1977. GM was faced with modest sales of the Motorhome and so it was not a sufficiently profitable product. In addition to this was the not inconsiderable problem of the ending of production for some of the Motorhome’s major parts. Production of the original Oldsmobile Toronado 455 cu. in. engine and Unified Powerplant Package was discontinued in 1977 and the GMC Motorhome had to be fitted with the Oldsmobile 403 cu. in. V8 engine with its significantly lower power and “Siamese bores” with consequent potential for overheating. 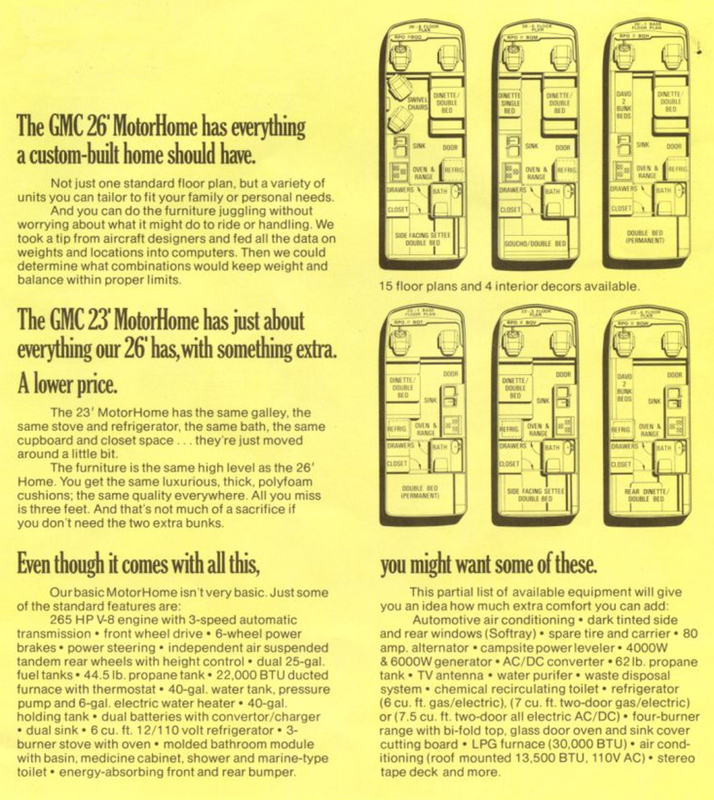 Thus it was that the writing was on the wall for the GMC Motorhome and production ended in 1978 after 623 23′ Motorhomes, 9,086 26′ Motorhomes, 1,016 23′ TransModes, and 2,190 26′ TransModes had been made, making a grand total of 12,921 vehicles. Engine: First models used a Oldsmobile 455 cu. in. (7.5 liter) “Rocket” gasoline “big block” V8 fitted with a single four barrel carburetor and producing 265hp. Later models were fitted with an Oldsmobile 403 cu. in. (6.6 liter) “small block” V8 which produced 185hp and torque of 320lb/ft. This “small block” engine had Saimesed bores which meant there was no coolant flow between the cylinders, something that could lead to overheating. Transmission: Turbo-Hydramatic three speed automatic gearbox driven by the engine via a wide roller chain. 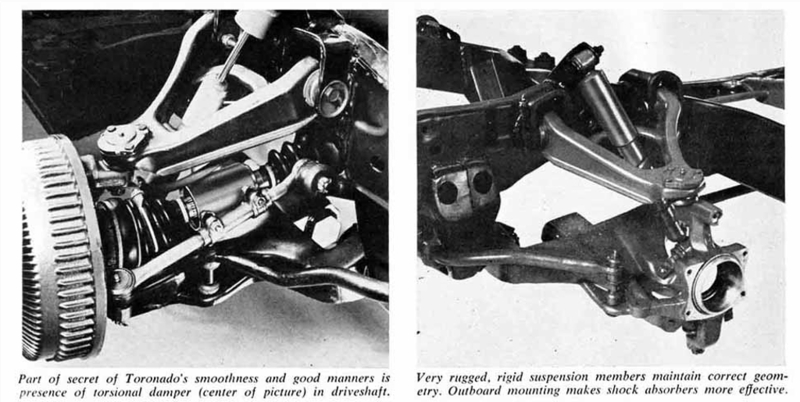 The gearbox and differential were integral and drove the front wheels by double-jointed half-shafts. Chassis and Body: Steel box section ladder frame chassis with welded extruded aluminum body frame. Body panels were fiberglass and the body assembly was mounted on the chassis with use of body isolators. Dimensions: Short wheelbase model length 23″ (7 meters) with a 140″ (3.6 meters) wheelbase. Long wheelbase model length 26′ (7.9 meters) with a 160″ (4.1 meters) wheelbase. Width 96″. Height 8’1″, height with roof air-conditioner 9’2″. Interior ceiling height 76″. Weight of the short wheelbase model was 10,500lb (4,800kg) and the long wheelbase was 12,500lb (5,700kg). Suspension: Front independent by torsion bars with double “A” arms and telescopic shock absorbers. Rear leading-trailing arms with a single air spring on each side shared between the tandem wheels. Air suspension adjustable and able to be used to level the vehicle for parking. Brakes: Servo assisted, front discs, rear drums on all four wheels. Tanks: Twin fuel tanks holding 25 US gallons (95 liters) each. 30 US gallon (110 liters) fresh water tank. 30 US gallons (110 liters) waste water holding tank. Ancillary equipment: 44.5lb propane tank, 22,000 BTU ducted furnace with themostat control, 6 gallon electric water heater (Note: The motorhome was provided with a marine water heating system that used engine coolant loops to provide hot water while the vehicle was being driven), dual batteries with converter/charger, 6 cu. ft. 12/110 volt refrigerator, 3 burner stove with oven, molded bathroom module with basin, medicine cabinet, shower and marine-type toilet. Optional equipment: front air-conditioning, roof air-conditioning, gas/electric refrigerator (6 cu. ft. or 7 cu. ft, two door), 7.5 cu. ft AC/DC two door refrigerator, tinted rear and side windows, 80 amp alternator, campsite power leveler, generator (4,000W or 6,000W), AC/DC converter, 62lb propane tank, TV antenna, waste disposal, chemical recirculating toilet, AM/FM 8 track stereo tape deck, and a range of other custom options. 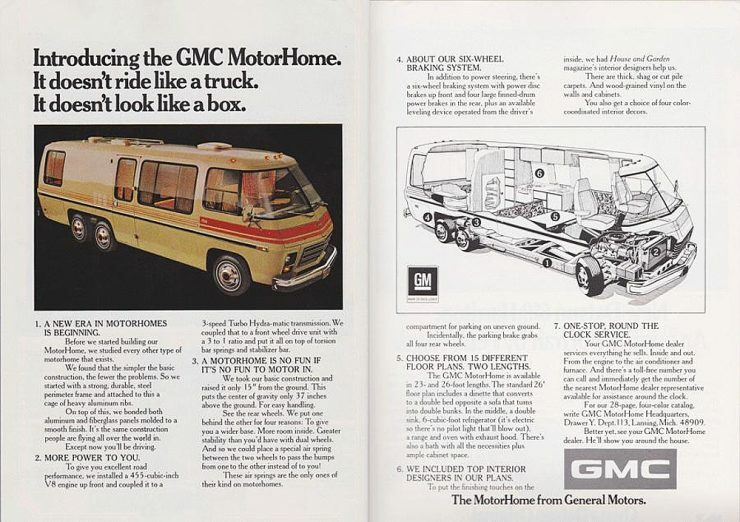 When General Motors took the GMC Motorhome out of production one might be forgiven for thinking that would be the end of the story and the vehicles would wear out, break down and generally rust in peace. But such a cruel but common fate did not await them. Owner loyalty was high, and the build quality was excellent with the result that these “home from home” vehicles were mostly treated to truckloads of tender loving care and the majority survived and prospered. Not only that but GMC Motorhome owners formed clubs to provide mutual support with advice on sources of parts and how to maintain or re-model one’s vehicle. As examples of the resources you can find, parts are available at Golby Motor Corporation if you click here. You’ll find the GMC Colonial Traveler’s Club with useful links and information if you click here. 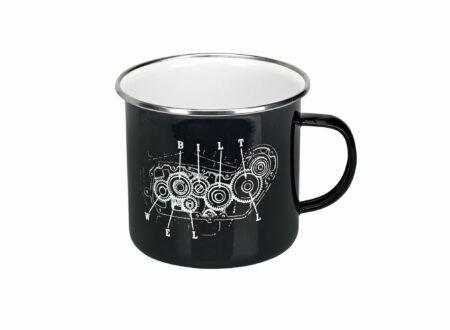 GMCers.org is another worthwhile page to visit if you click here. That is just a starting point, the GMC Motorhome has an extensive range of resources and there is even a club way “Down under” in Australia because a few GMC Motorhomes made the journey to the Land of Oz and some were even converted to right hand drive. You’ll find the Aussie Classic GMC Motorhome Club if you click here. 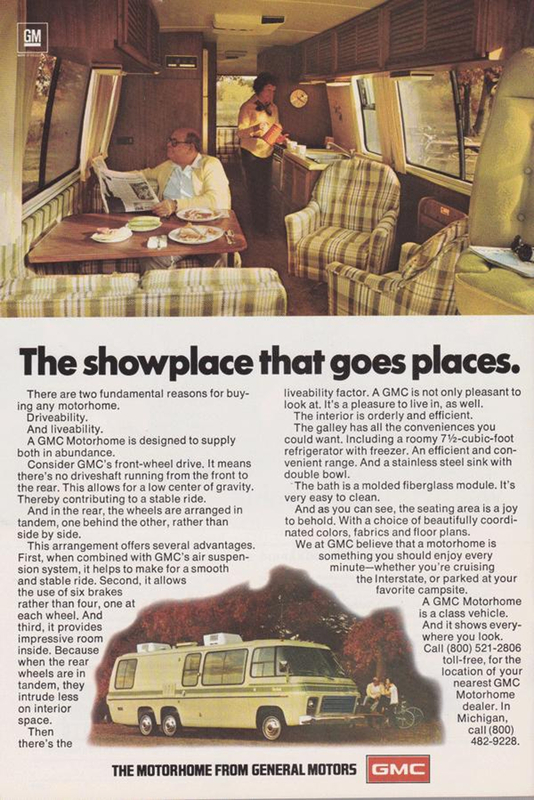 The GMC Motorhome is still a crowd gatherer four decades after production ceased, and in terms of the percentage still on the road after all those years they probably beat the Land Rover. These were a vehicle that were built to last, and last they have, and they were a vehicle that was designed to be a joy to own, hence the degree of owner loyalty. They remain one of the most comfortable and convenient vehicles in which to do a long journey with the only downside being fuel economy, which tends to be around 9 miles to the US gallon. That being said if one is towing a 26′ caravan then one’s fuel economy is not likely to be better than that. The GMC Motorhome might not be one of the fastest and most impressive vehicles to come out of the creative 1960’s and 1970’s, but it surely must be one of the most enjoyable to own and travel with. We suspect that the surviving examples will still be around giving pleasure and freedom of the open road in another four decades time. Photo Credits: General Motors, GMC, Aussie Classic GMC Motorhome Club.